A sweet little cake is just perfect to share during parties or just enjoy for a dessert the family will love! 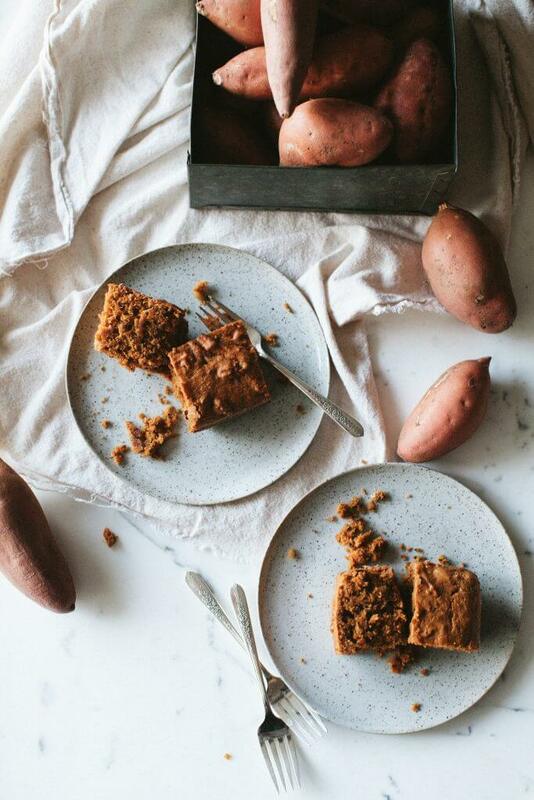 Not to mention, sweet potatoes add the perfect amount of moisture the cake, and the pecans make this recipe pure magic. Bake 6-8 medium-sized sweet potatoes at 400 degrees F for 1 hour. Potatoes should be soft and fragrant. Set aside to cool. Peel and mash sweet potatoes in a medium-sized bowl. Measure out two cups of sweet potato, mash it up and set aside. (Mash should be room temperature). Toast the pecans, if not already toasted. Lower oven temperature to 375 degrees F and bake nuts on a clean sheet pan for 8-10 minutes until dark brown. Take care not to burn them. They should be fragrant but smell burned. Lower oven temperature again to 350 degrees F. Grease a 9 X 13″ pan with softened butter. Using a whisk, combine all dry ingredients except sugar in a large bowl, set aside. In another large bowl, combine sweet potato mash, sugar and buttermilk. Add eggs one at a time and whisk until combined. Slowly stream in oil, and whisk until combined. Add wet mixture/sweet potato into dry ingredients, folding in together. Once ingredients are almost combined, add pecans and chocolate. Fold gently until incorporated and do not over mix. Pour batter into greased cake pan and bake for 45-50 minutes, or until cake is set. It should be very golden brown on the top and the center of the cake should spring slightly when pressed. Cool completely for 20-30 minutes before serving.